The Blaine Franger Photography Blog: "Beautiful Hood River" photography exhibit TONIGHT! 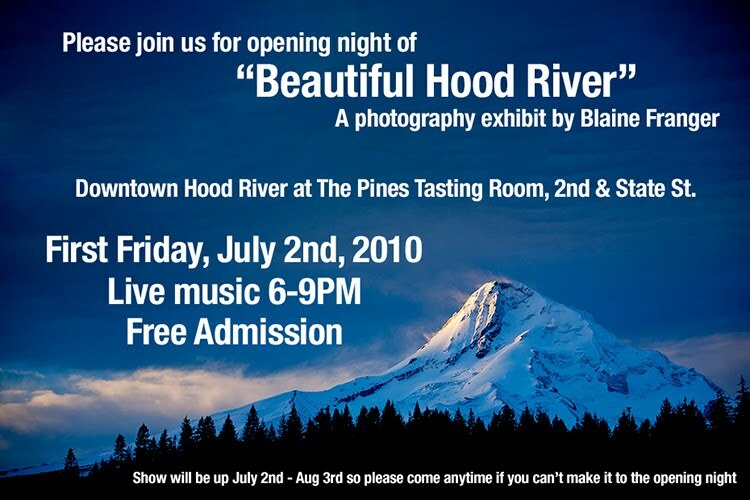 "Beautiful Hood River" photography exhibit TONIGHT! Please join us for opening night of "Beautiful Hood River". A photography exhibit by Blaine Franger. Downtown Hood River at The Pines Tasting Room, 2nd & State St. First Friday, July 2nd, 2010. Live music 6-9PM, Free Admission. Show will be up July 2nd - Aug 3rd so please come anytime if you can't make it to the opening night! Nice photo. :) The mountain in the background is really beautiful. Check out my photography blog too!